Melanoma is a potentially dangerous form of skin cancer. It is diagnosed less frequently than other types of skin malignancies but has the ability to spread (metastasize) very quickly. Melanoma most often begins on the skin itself but can spread to the other parts of the body including beneath the fingernails and toenails and on the eyeball. While no one really knows the biological mechanisms give rise to melanoma, we do know that there are risk factors that greatly increase the likelihood of the disease. With this being said, melanoma can develop in people who have none of these traits, including young people and people with dark skin. Changes in the appearance of a mole are often the first sign of a developing melanoma and should be considered a red flag irrespective of size or location. Learning to differentiate between a normal mole and an abnormal one can help you identify any changes before they become a serious problem. To this end, we use what is called the ABCDE Rule of melanoma, a system which can help a person discern between what is normal and what is not. It should not be considered a means of diagnosis—only a doctor can do that—but rather the warning sign to contact a dermatologist as soon as possible. Asymmetry - Normal moles or freckles are completely symmetrical. If you were to draw a line through a normal spot, you would have two symmetrical halves. In the case of skin cancer, spots will not look the same on both sides. Border - A mole or spot with blurry and/or jagged edges would be considered concerning. Color - A mole that has more than one hue, color, or shade (including the lightening or darkening of the mole) should also be considered suspicious. Normal moles, by contrast, usually have only one color. Diameter: If the mole is larger than a pencil eraser (1/4 inch or 6 mm), it should signal the need for specialist attention. This includes moles that do not have any other visible abnormalities. Evolution: This refers to changes in existing moles, including changes in the size, symmetry, border, or color. Keep in mind that a mole does not have to meet the complete ABCDE criteria to be of concern. Even one abnormality should warrant immediate investigation by a qualified professional, preferably a dermatologist. 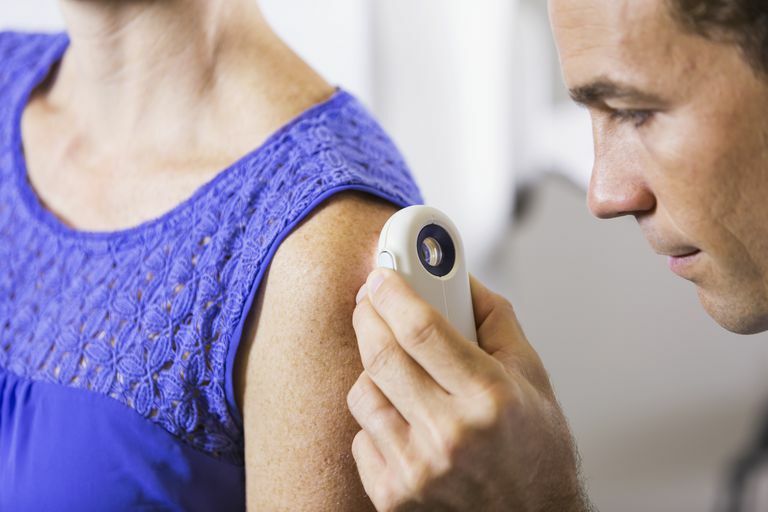 Diagnosing skin cancer typically begins with a skin exam by a licensed dermatologist. If cancer is suspected, a skin biopsy would be performed to begin the microscopic analysis of the affected cells. This can be done in several ways and, depending on size and location, can be performed in the doctor's office with a local anesthetic. If the biopsy results show the presence of melanoma, additional tests will be performed to determine if and how far the disease has spread. These tests can include chest X-rays, liver function tests, and other assays to determine whether there is any evidence of cancer in other organ systems. There are currently four methods of treating melanoma: surgery, chemotherapy, radiation therapy, and immunotherapy. Treatment depends largely on how far the cancer has spread, as well as the age and overall health of the affected individual. For those with early stage melanoma, surgery to remove the lesion (along with a small margin of healthy tissue) may be all that is needed. The procedure might also include the biopsy of a nearby lymph node to confirm that cancer has not spread. If the disease is more advanced, chemotherapy and immunotherapy may also be necessary, with the duration of treatment based largely on the stage of the disease. Radiation therapy may be used in select cases. Skin cancer may be the most common type of cancer, but it is also the most avoidable. The first step in preventing skin cancer—and arguably the most important—is to avoid UV ray exposure. Avoiding midday sun between 10:00 a.m. to 4.00 p.m. keeps you protected when the sun is at its brightest. Wearing protective clothing, like a hat and tops with full sleeves provides an added layer of protection when you have to be in full sunlight. Eyes are also susceptible to damage so be sure to wear sunglasses that offer adequate UV protection. Staying in the shade will not only keep you cooler, it will reduce your risk of excessive UV exposure. Even so, it's best to wear sunscreen as reflected sunlight can be just as harmful as the direct sun. Avoiding tanning beds is a must. Artificial UV exposure is not any less dangerous than natural exposure. In fact, most studies suggest that tanning beds increase your risk of melanoma due to their focused intensity and the lack of sunscreen among users. Melanoma is a scary word, and it should be. It develops quickly and causes more deaths than any other form of skin cancer. But it is also among the most treatable, with high rates of success if spotted early. As with all type of cancers, prevention is key. This includes reducing your exposure to direct sunlight and other forms of UV radiation, and covering up with sunscreen and protective clothing as much as possible. Finally, if you do find a suspicious mole or spot on your skin, don't ignore it. Get it looked at as soon as possible by a qualified dermatologist. Don't let a little problem suddenly become a life-threatening one. Markovik, S.; Erickson, S.; Rao, R.; et al. "​Malignant Melanoma in the 21st Century, Part 1: Epidemiology, Risk Factors, Screening, Prevention, and Diagnosis." Mayo Clinic Proceedings. March 2007; 82(30):364-380.